OpsCenter tracks all in-process and completed backup and restore operations. View the status of the current and recent jobs, page through completed jobs, and view the detailed status of a particular backup or restore operation in the Activity tab. The details of all completed backup and restore operations are stored in the OpsCenter keyspace in Cassandra in the backup_reports table. The data is stored whether or not the operation was successful. The first time the Backup Service starts, it scans for existing backups, including backups from versions of OpsCenter prior to 5.1, and populates the backup_reports table. 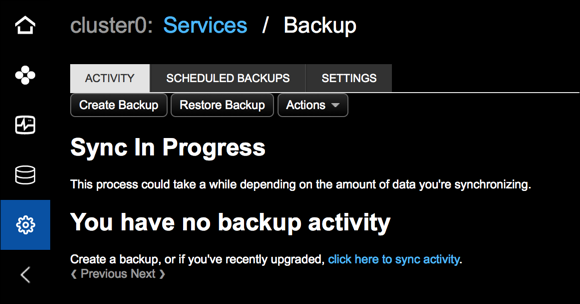 To manually synchronize the backup_reports table, click Actions > Synchronize Data. Select the locations whose history you want to synchronize and click Sync Data.